21-Story Downtown Mixed-use Condo Project or Mardis Gras Park? Mobile County Commission President Juan Chastang released a rendering of a proposed $85-100 million condominium project on the site of the recently demolished 1950s courthouse. The ground floor would include retail space and a restaurant with outdoor seating next to a fountain pool. This project is on the site of the Mardis Gras Park approved by the county commission in 2002. The new county commission wants a revenue generating project instead of public space. Mobile Mayor Sam Jones, a member of the commission in 2002, is not happy about this change, and wants the previously approved park project to be built. It remains to be seen if Chastang can get the commission to go along with his proposal, which also includes replacing the adjacent courthouse annex. 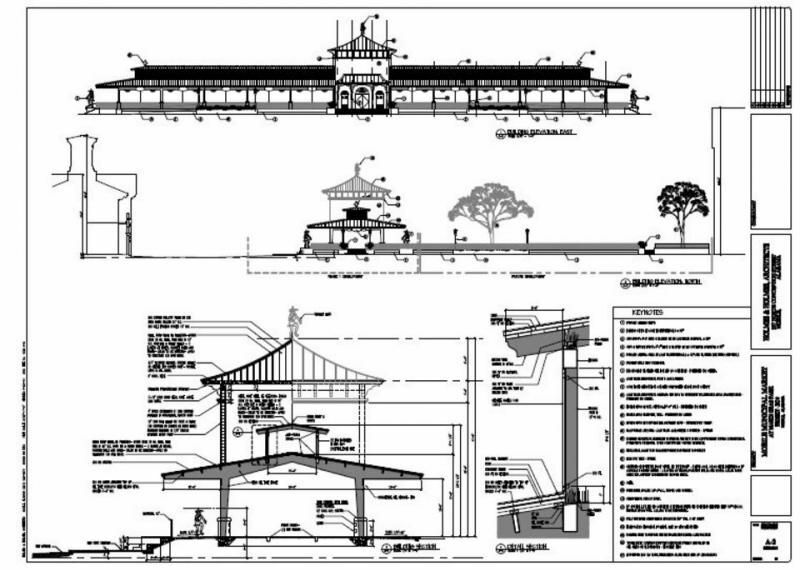 The Mardis Gras Park proposal provides park space for Mardis Gras functions, and includes a water feature, special colored lighting, statues of Excelsior band members, and a clock tower designed to look like the landmark watch tower on the old 19th century Guard House. Mobile Mayor Sam Jones made a surprising offer to the county commission to swap more valuable downtown civic center land (21.5 acres) for the old courthouse property (2.7 acres) that the county wants to develop into a mixed-use condo project. The mayor is serious about building the Mardis Gras Park on the vacant county property. 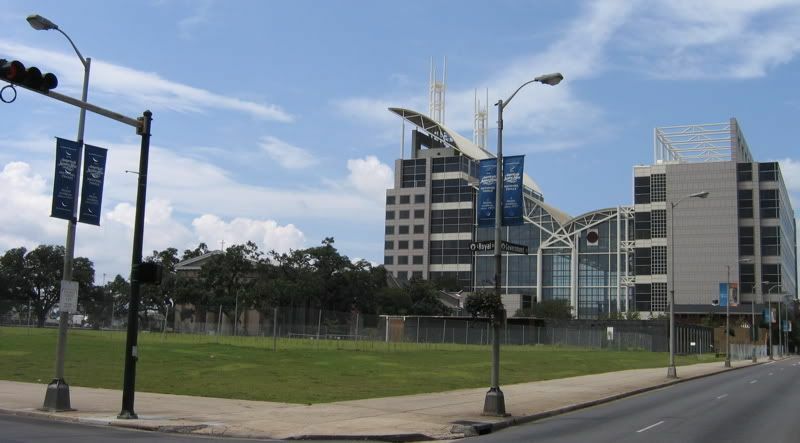 The proposal would include tearing down the existing Mobile Civic Center complex, and then building a new arena, theater, and parking deck; with a mixed-use condo development on the huge surface parking lot. Two of the three county commissioners said they would be willing to discuss the deal. I'm actually in favor of an open park in this location. I am STRONGLY in favor of added residential in downtown Mobile, and encourage developers at any given opportunity to develop residential downtown, but in this location I feel a Mardi Gras themed park would be invaluable in the future. Redevelopment of downtown is imminent, and there are plenty of blighted properties that the city doesn't own that can be developed for condo use. The development of a condo would benefit Mobile greatly in the short term and possibly further spur downtown redevelopment, but 20-25 years from now when we see 10's of thousands of residents downtown and land to develop scarce, open space will be at a premium. 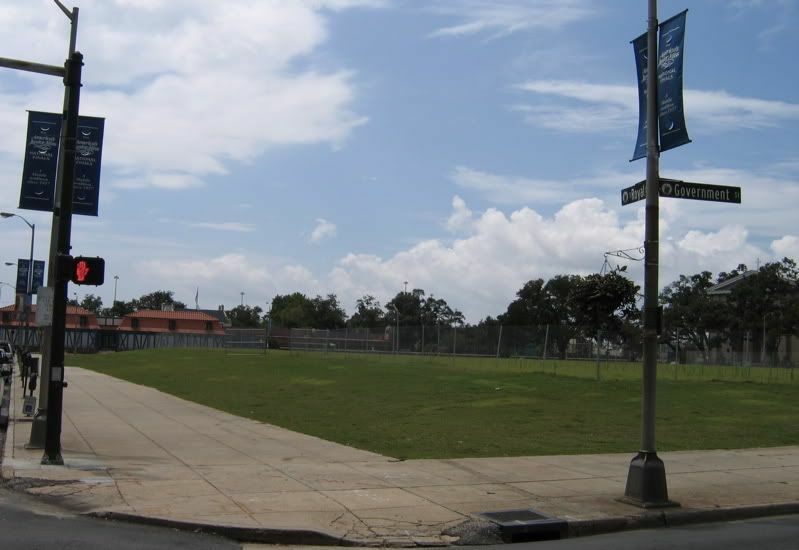 Plus, this location is right along parade route A and would be the location for many civic events such as Mardi Gras, Bayfest concerts, and other events that would benefit the city as a whole. I believe the Civic center location would be much more fitting for a condo redevelopment rather than this central downtown location. check out my Mobile's Viagra Fourm for the right way to geaux about the land. I will post later on this import subject in Mobile's future....... For now im geauxing fishing .the specks are biting! How did you do fishing bayourat?? Before Katrina my family and friends would spec fish out of Waveland MS. Some Palm trees would look nice in the subtropical climate Mobile has. 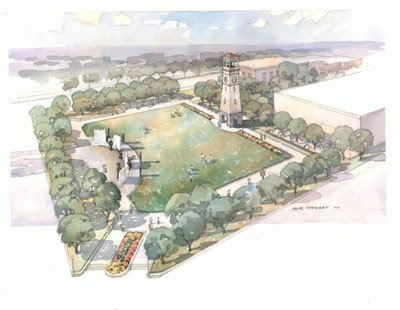 The Madi Gras park and new clock tower will be a nice addition. Mobile is "on the move"! Park all the way. Not only would it be kinda historical. It might spur more interest in downtown to build new buildings that are better than that condo tower. Think of the future before you do what looks best for the now. I like the park idea. That location has been public property for over a hundred years and it should stay that way, providing much-needed quality public space for all area residents. Bayourat's excellent mixed-use proposal would be a good fit for the civic center site. Mobile County Commission President Juan Chastang, who proposed the condominium development for the courthouse property, has been removed from the county commission by a panel of federal judges. The decision will likely be appealed and Chastang might remain on the commission until a final decision is reached. Chastang was appointed by Gov. Riley to serve out the term of Mayor Sam Jones. Hopefully Nodine will take control of the project and build the damn thing! Went downtown the other day and saw and talked to people from the cruise ship. They asked '' Whats this large piece of undeveloped land. I told them a park with a water display or maybe a HIGHrise condo with outdoor shops and places to eat. ..... In response they said, " Why do we want to sit down and watch a water display? We're fixin to go on a 5 day cruise! '' ....As i wuz leaving i thought ; how the hell is Mobile thinking about a second ship? , when people are not happy , cause theres nothing to do in port! And the idea the mayor came up with . About puting this condo/entertainment area where the run down Civic Center is , is crazy! How is tourist on the ships going to get there? Walk across I-10 ? As a city , we need to keep this booming momentum Up ! Went downtown the other day and saw and talked to people from the cruise ship. They asked '' Whats this large piece of undeveloped land. I told them a park with a water display or maybe a HIGHrise condo with outdoor shops and places to eat. ..... In response they said, " Why do we want to sit down and watch a water display? We're fixin to go on a 5 day cruise! '' ....As i wuz leaving i thought ; how the hell is Mobile thinking about a second ship? , when people are not happy , cause theres nothing to do in port! And the idea the mayor came up with . About puting this condo/entertainment area where the run down Civic Center is , is crazy! How is tourist on the ships going to get there? Walk across I-10 ? It's not about the water feature, it's about more greenspace downtown. Savannah has over 20 squares in its central downtown area, and those squares make it such a great place to be. More quality greenspace will make Mobile a more attractive city, and that property near the waterfront is a good location for a park, between the cruise terminal and downtown hotels. As renovation of old buildings and infill development picks up, the walkable area of downtown with active uses will expand beyond the Dauphin/Royal area and toward peripheral downtown areas like the civic center. If everything goes right, we'll be walking all over downtown and have plenty of interesting things to do. According to County Commissioner Steve Nodine, the old courthouse site will be used for a park. The proposed Mardis Gras Park could cost $5-6 million, and the city may need the county to help finance the new park. However, County Commission President Stephen Nodine said that any deal on the park would be contingent on a compromise that would allow the county to start work on its new Probate Court building. 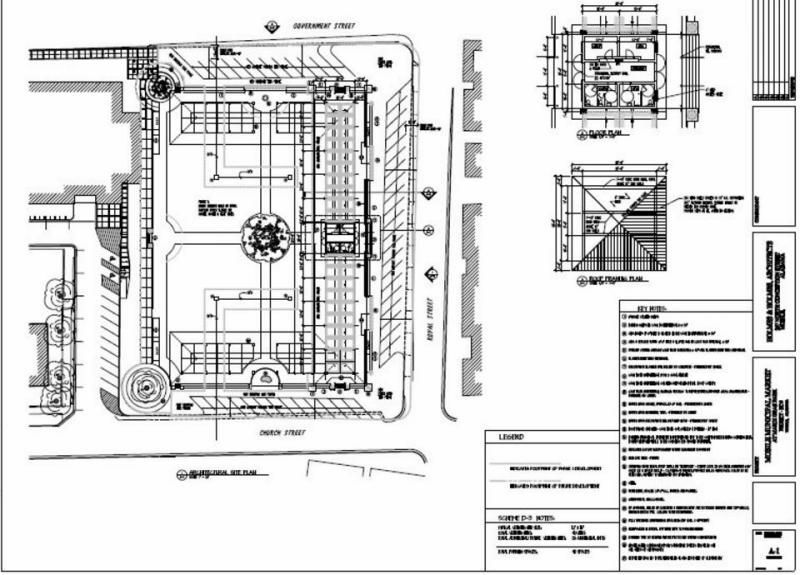 Mobile's Architectural Review Board denied the county permission to build the Probate Court building next to Government Plaza because the design doesn't fit the standards of the Church Street East Historic District. The county commision is acting dumb. Why did they even try to get a non historic design passed anyways? I hope the city doesn't allow the county to build until they change the design. Steve Nodine is an idiot!! I like it. Looks like a good rendering to me. I'm assuming this is on the route of the parades? Do we know any specific amenities that it will have. Do we know any specific amenities that it will have. 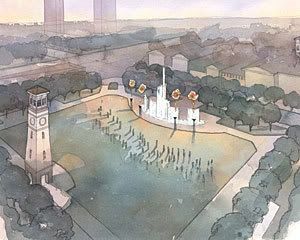 Also, a 2004 Press-Register article said it "would have a clock tower with a purple light that will be lit during Carnival, statues of the Excelsior Band and a fountain that would spray water in time with music." Does anyone know if the park plans have been changed? Mobile County officials expect to begin construction on a Probate Court building this summer, making it possible that land could be available in early 2010 for a downtown park. The city hasn't hired an architect to design the park yet, but the park is supposed to include a water display, performing arts stage and something commemorating Mobile as the birthplace of Mardi Gras. 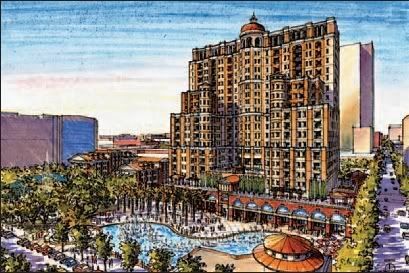 I guess the previously posted drawings, done by Goodwyn Mills & Cawood, may not represent what the park will actually look like. The County Commission voted 2-1 to lease the courthouse site to the city of Mobile for 50 years, with an additional two 20-year terms for a total of 90 years for $1. Work on the Mardis Gras park will begin after construction of the adjacent courthouse annex. The Mardis Gras park lease between the city of Mobile and the Mobile County Commission was to be signed Monday. The $1.00 lease runs 50 years, with two additional 20-year terms, for a total of 90 years. Mobile Mayor Sandy Stimpson plans to go ahead and build the long-discussed Mardis Gras Park with an open-air market inspired by the Charleston City Market and New Orleans' French Market. The market would include room for 40 vendors. I like this idea a lot. However, i really wish they would change the name. Kind of trying to hard. I know Mobile likes to push Mardis Gras, but there are so many other great historical figures and events in Mobile's past to honor. Not a Carnival celebration that happens all along the Gulf Coast and around the world. Even if Mobile was the first in the lower 48 to celebrate it. It just doesn't feel completely unique to me.